Definition at line 41 of file nfd-rib-readvertise-destination.hpp. Definition at line 39 of file nfd-rib-readvertise-destination.cpp. Definition at line 54 of file nfd-rib-readvertise-destination.cpp. References getCommandOptions(), getControlParameters(), ndn::nfd::CommandOptions::getPrefix(), NFD_LOG_DEBUG, nfd::rib::ReadvertisedRoute::prefix, ndn::nfd::ControlParameters::setName(), ndn::nfd::CommandOptions::setSigningInfo(), nfd::rib::ReadvertisedRoute::signer, and ndn::nfd::Controller::start(). Definition at line 68 of file nfd-rib-readvertise-destination.cpp. 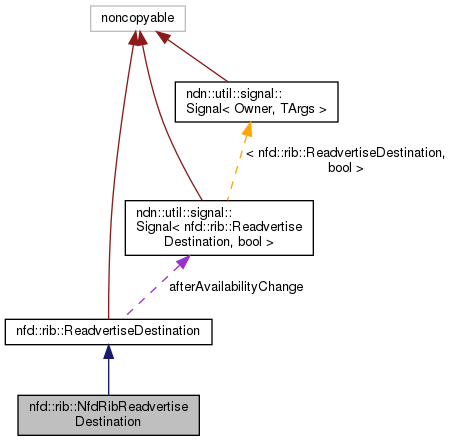 Definition at line 82 of file nfd-rib-readvertise-destination.cpp. Referenced by advertise(), and withdraw(). 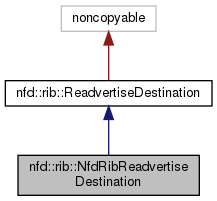 Definition at line 88 of file nfd-rib-readvertise-destination.cpp.